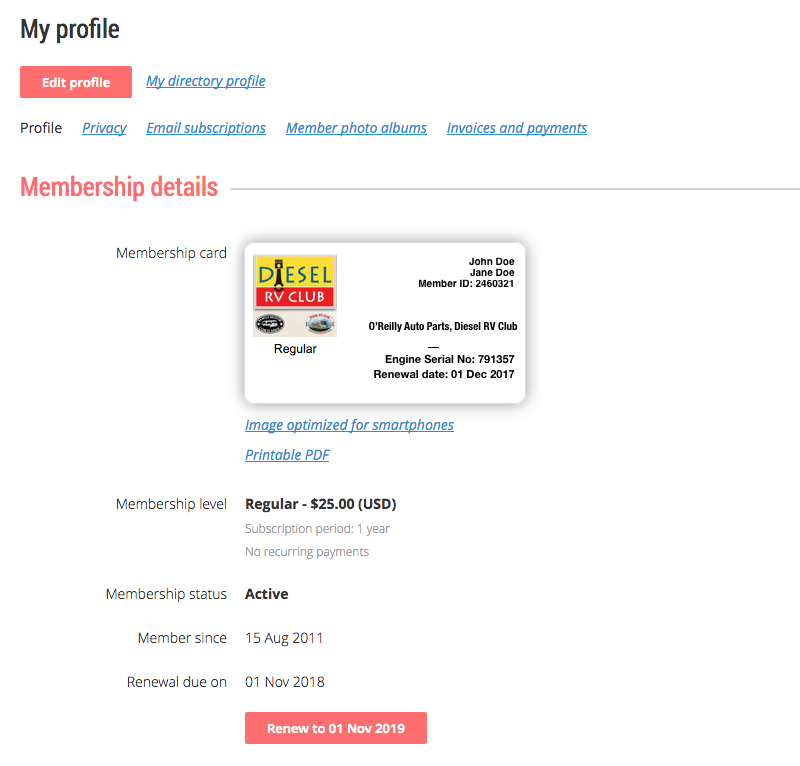 Renewing your membership in Diesel RV Club is relatively easy. Before your renewal date, you will receive an invoice emailed to your official email account, the account used for logging into as a member. In the invoice will be a clickable link that can be used to renew without logging into the website. However, if you loose track of that email you may use the following information to renew your membership for another term. To renew your membership in Diesel RV Club, simply follow these instructions. Log in to your membership area using the appropriate name and password. If you need assistance with logging in, go to the Home page and click on the topic “Login Help” located at the top of the right column. You will be taken to a page that looks like the image at right. Look down the page to see the status of your membership and the renewal date. At this point you may do one of two things. b) click on the “Renew to…” button under the area that displays the renewal information. This will display the same page but make the fields open for editing. Check that the information is correct and then click on “Update and next” located at either the top of bottom portion of the page. On the next page you will see “Review and confirm” highlighted by blue. At this point you have the option of being sent an invoice or paying online. Select one of those options and follow the instructions that will be presented. Note that you will also have the option of going back or cancelling the action.